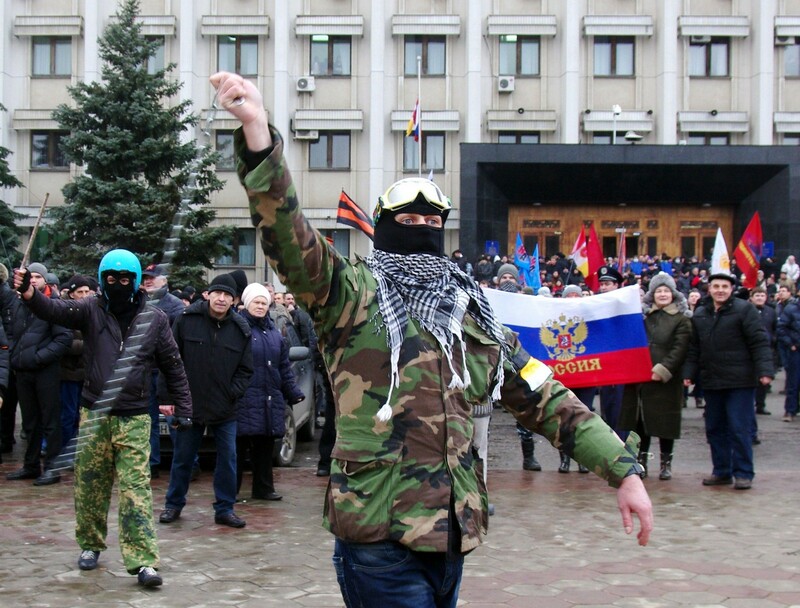 WASHINGTON - The Pentagon said on Thursday it was focusing for now on Ukrainian requests for non-lethal support, as opposed to any weaponry, as a senior US official said Washington wanted to avoid further militarizing the standoff with Russia. 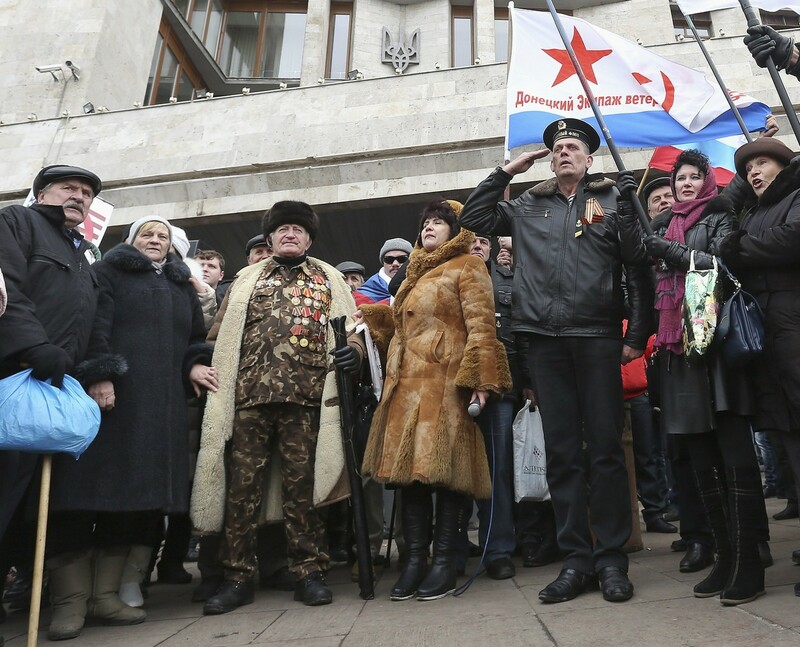 Ukraine's government has put its heavily outnumbered and outgunned forces on alert for an invasion from Russia in the east following Moscow's seizure of Crimea. Kiev has asked for military support from the United States, which US officials, speaking on condition of anonymity, say includes small arms, as well as non-lethal assistance, such as medical supplies. So far, the US government has only approved providing military food rations, officials say, as President Barack Obama's government instead focused on financial support for Ukraine and pressuring Russia diplomatically. "I think it's safe to say that right now, the focus of that review (of Ukraine's military requests) is on the non-lethal side of things," Pentagon spokesman Rear Admiral John Kirby told a news briefing. "But it is very much still an active issue under consideration." 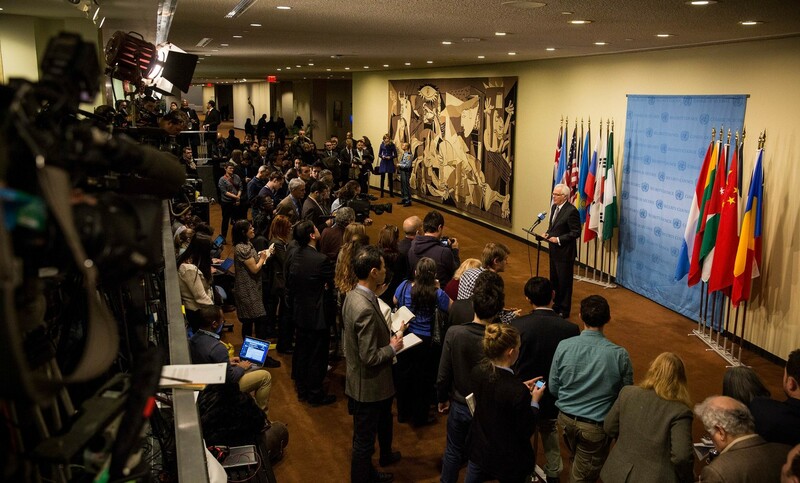 Obama's critics, including Senator John McCain, a Republican from Arizona, have lambasted the hesitancy, saying last week the United States should not be "imposing an arms embargo on a victim of aggression." 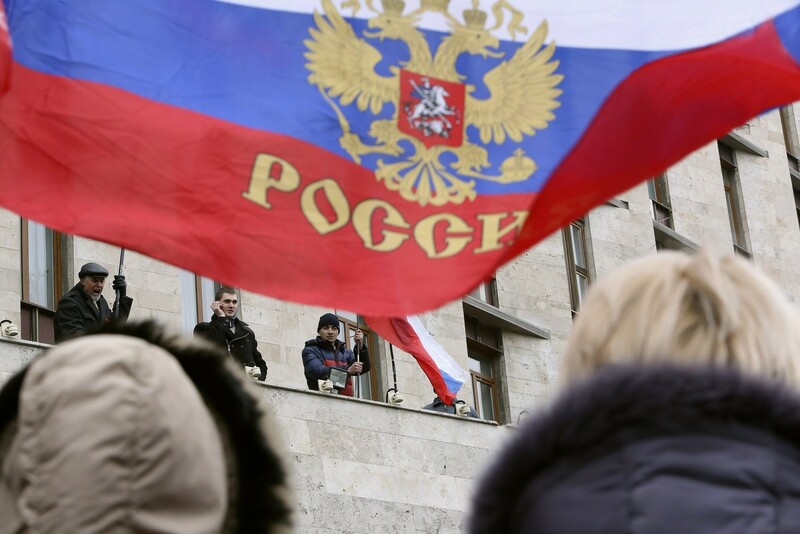 Still, a senior administration official, defended Obama's approach on Thursday, as Washington unveiled new sanctions against Russian President Vladimir Putin's closest long-time political and business allies. 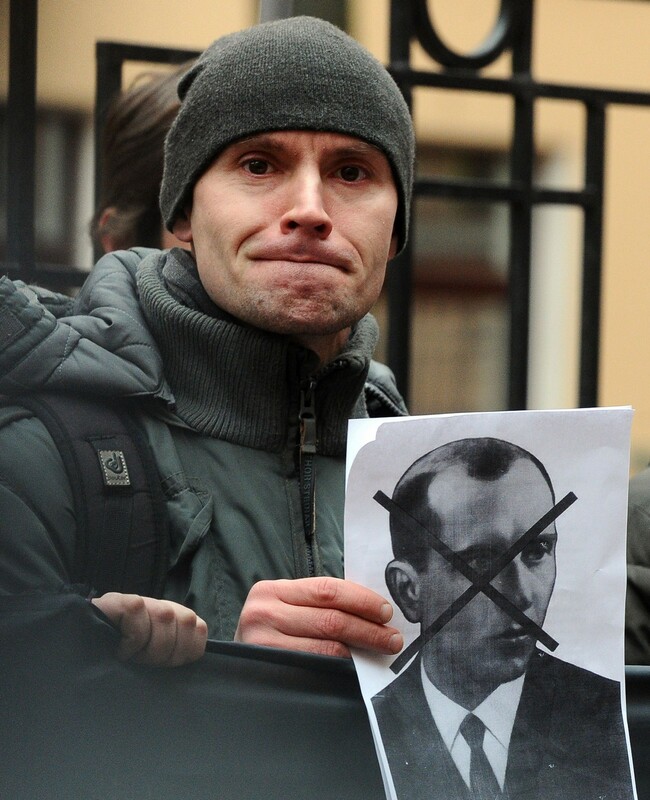 "It's our view that the best course here is to lay down strong costs through these sanctions ... We don't want to takesteps to add to a momentum of further militarizing the situation," the official said, speaking on condition of anonymity. Kirby did not offer a timeline for the review of Ukrainian requests. He noted the food rations have not been delivered yet. "There are other non-lethal items which are being considered. I don't want to go into them by detail and give you a shopping list, but, in general, it's on the order of medical supplies and uniform equipment and that kind of thing," he said. 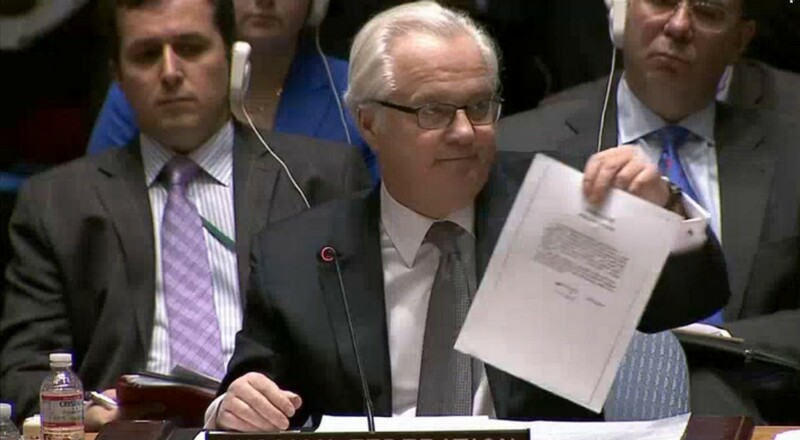 Vitaly Churkin, Russia's ambassador to the United Nations, shows a letter to the U.N. Security Council in New York purportedly from ousted Ukrainian leader Viktor Yanukovich to Vladimir Putin asking the Russian leader for military intervention in Ukraine in this still image from UNTV video March 3, 2014. 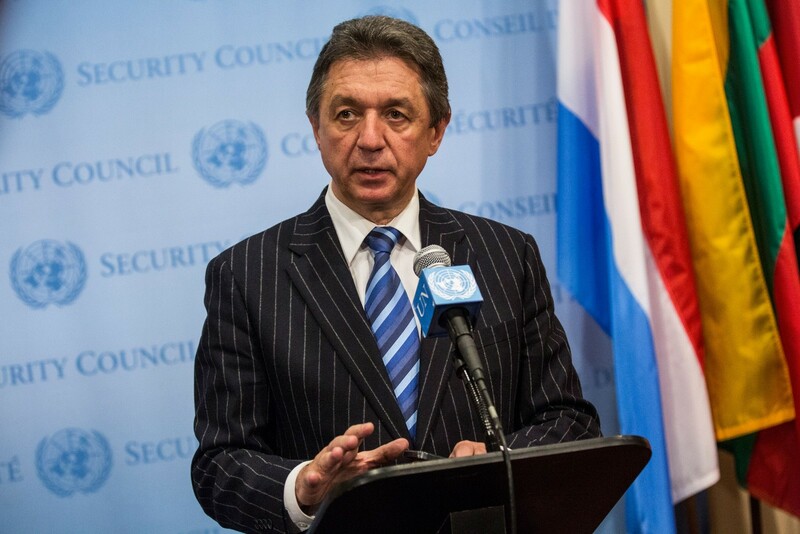 Ukrainian permanent representative to the United Nations (UN) Yuriy Sergeyev speaks to the media after a UN Security Council meeting on March 3, 2014 in New York City. 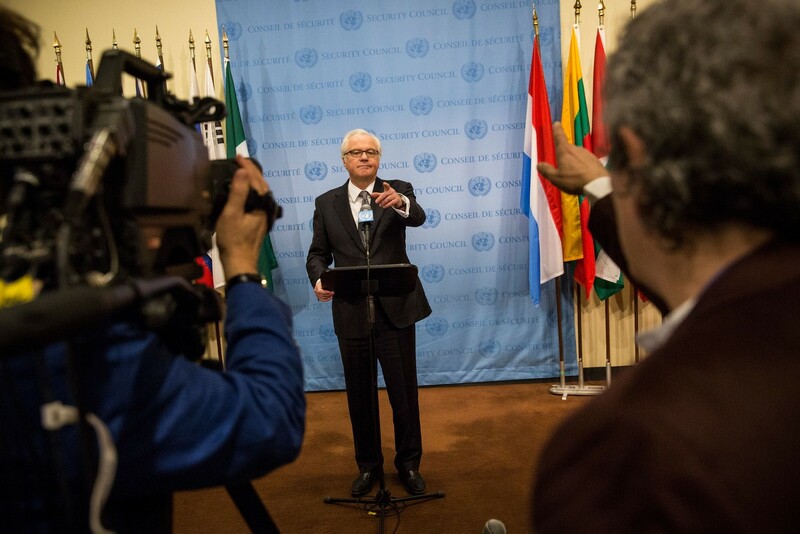 Russian Permanent Representative to the United Nations (UN) Vitaly Churkin speaks to members of the media after a UN Security Council meeting on March 3, 2014 in New York City. 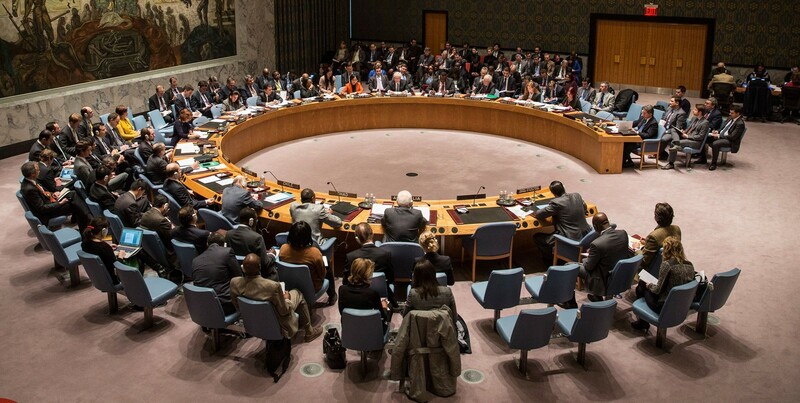 As tensions between Russian's occupation of parts of Ukraine intensifies, the Security Council has continued to meet in an effort to find a solution. 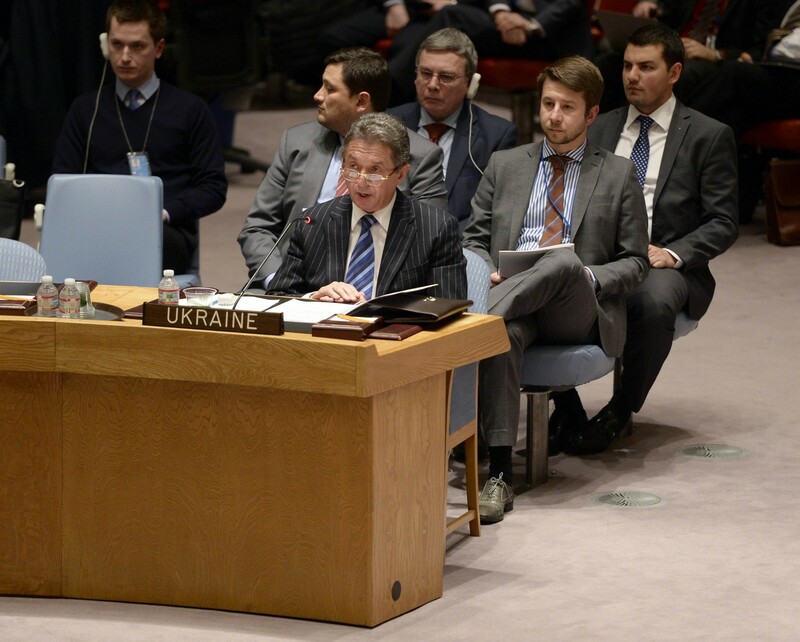 Security council members attend a meeting on the crisis in Ukraine at the U.N. headquarters in New York March 3, 2014. 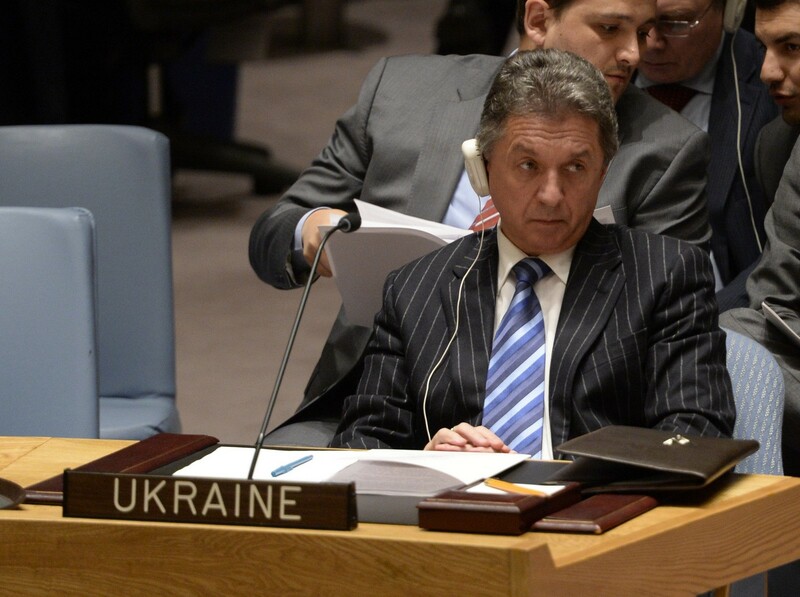 Ukraine Ambassador to the United Nations Yuriy Sergeyev during a Security Council meeting at the United Nations in New York March 3, 2014. 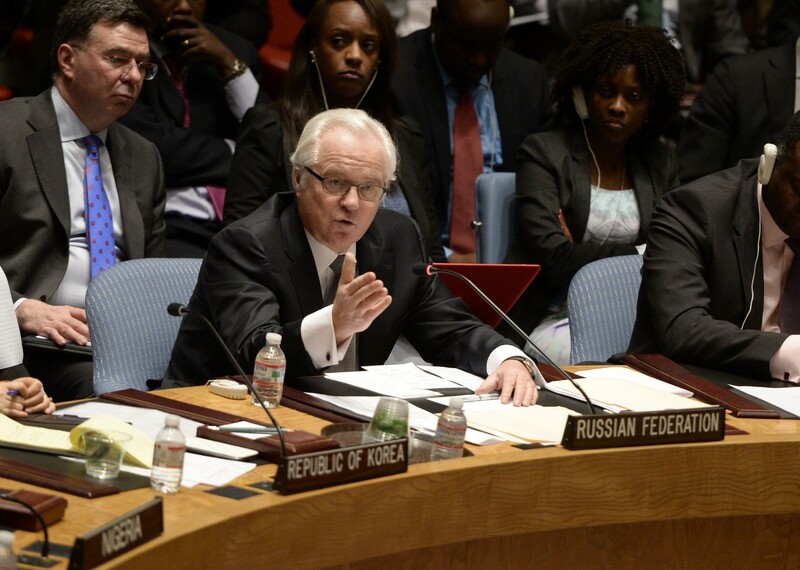 Vitaly Churkin, Permanent Representative of the Russian Federation to the United Nations speaks during a Security Council meeting at the United Nations in New York March 3, 2014. 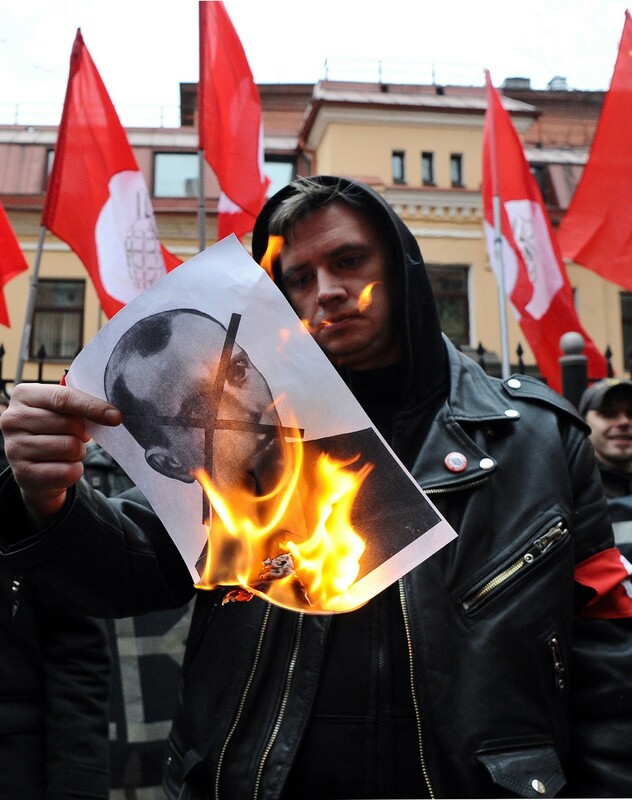 An activist of the "Other Russia" opposition party burns a crossed-out portrait of Stepan Bandera, the leader of the Ukrainian nationalists in the 1940s, during a rally in support of ethnic Russians in the Crimea and Eastern Ukraine in St. Petersburg, on March 3, 2014. 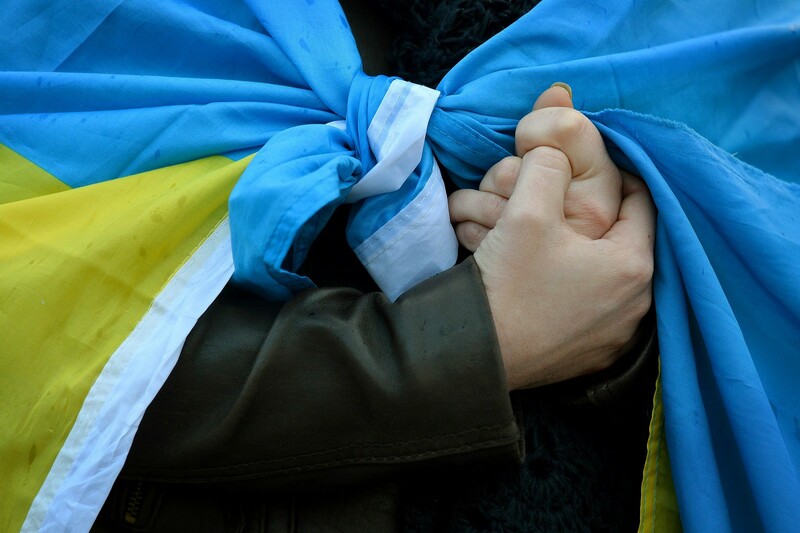 A protester draped in a Ukrainian flag demonstrates against Russian intervention in Ukraine, during a demonstration in London's Parliament Square, on March 3, 2014. 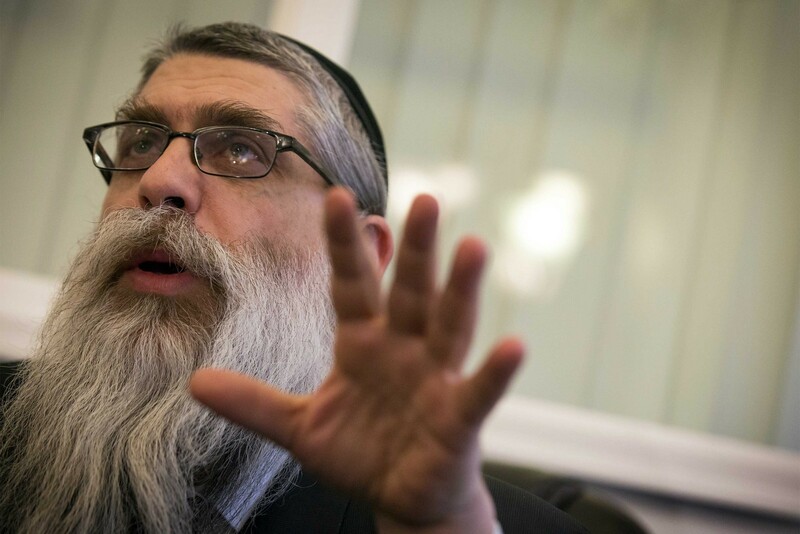 Rabbi Yaakov Dov Bleich, Chief Rabbi of Ukraine, speaks during a news conference in New York March 3, 2014. 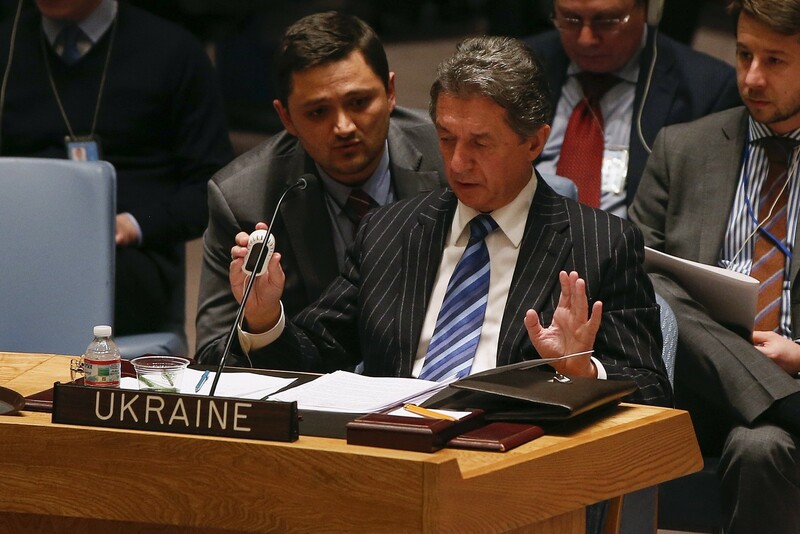 Ukraine Ambassador to the United Nations Yuriy Sergeyev speaks during a Security Council meeting at the United Nations in New York March 3, 2014. 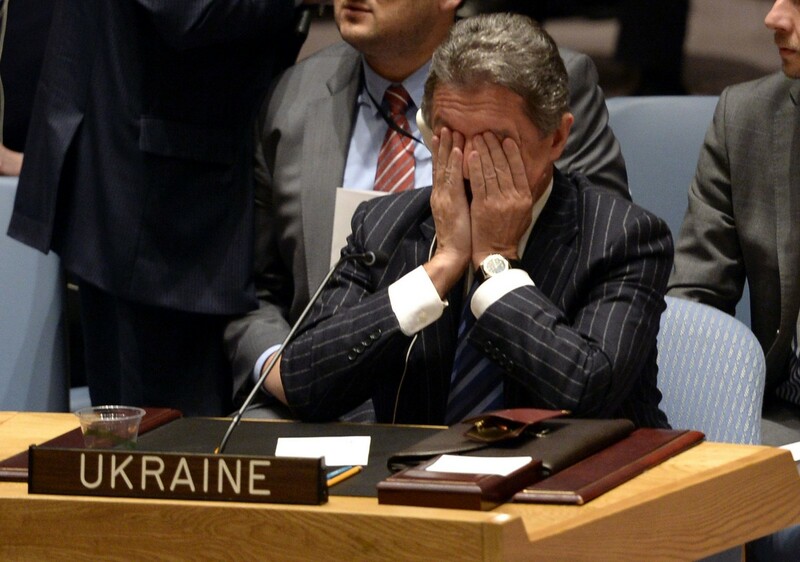 Ukraine's Ambassador to the United Nations Yuriy Sergeyev speaks during a Security Council meeting on the crisis in Ukraine, at the U.N. headquarters in New York March 3, 2014. 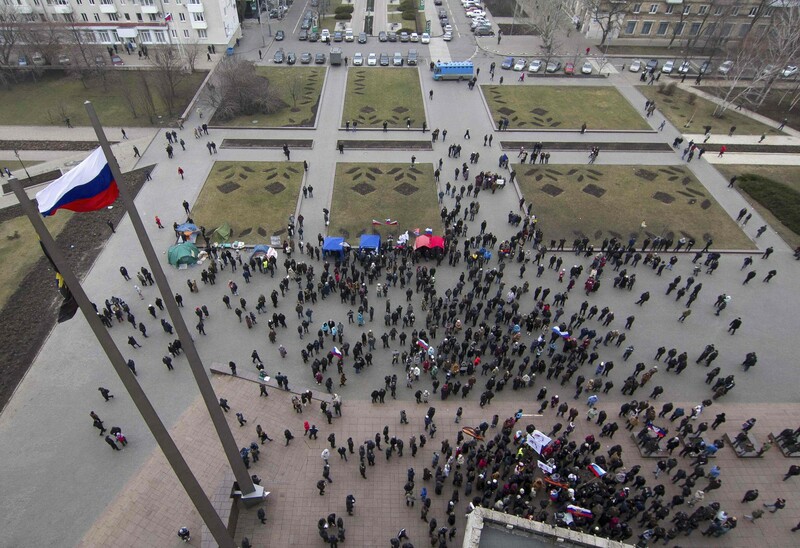 Pro-Russian demonstrators hold a rally outside the regional government building in Donetsk, March 3, 2014. 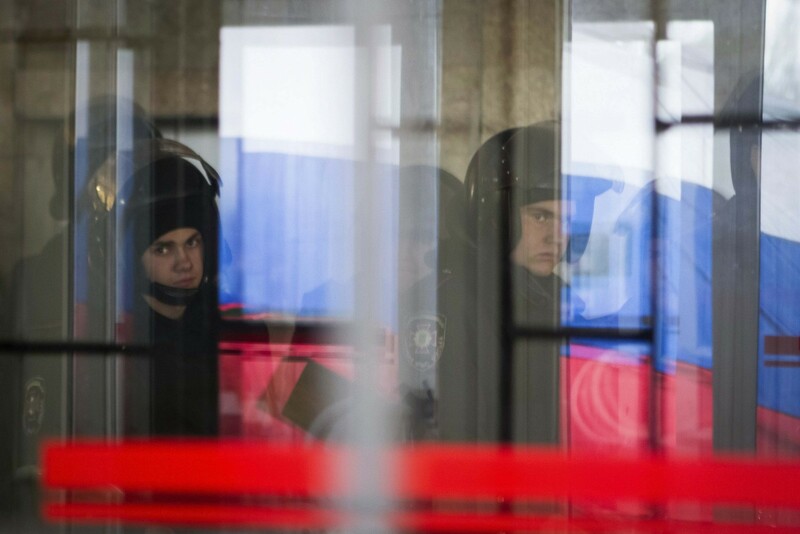 Ukrainian Interior Ministry members are seen through windows of the regional government building as pro-Russian demonstrators hold a rally in Donetsk, March 3, 2014. 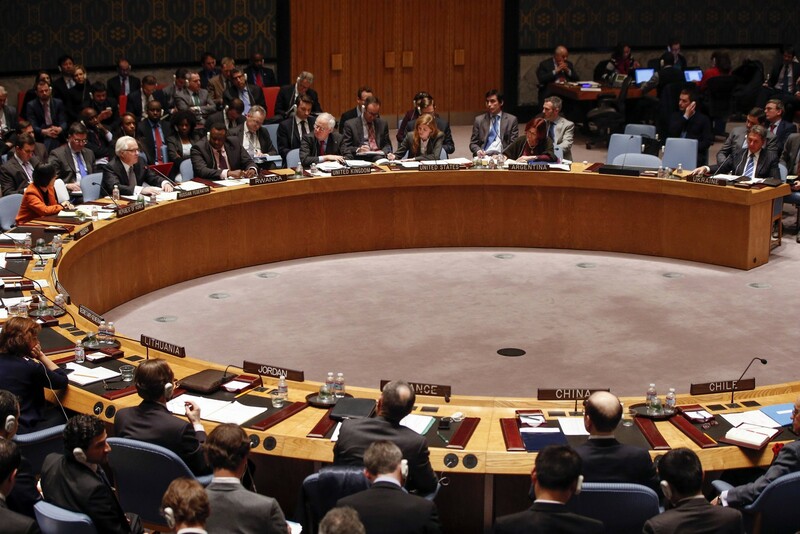 A United Nations (UN) Security Council meeting takes place on March 3, 2014 in New York City. 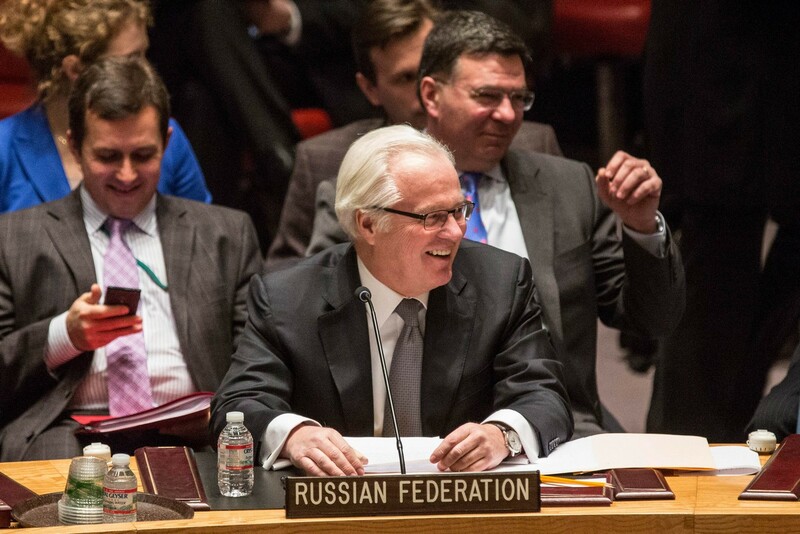 Russian Permanent Representative to the United Nations (UN), Vitaly Churkin, arrives at a UN Security Council meeting on March 3, 2014 in New York City. 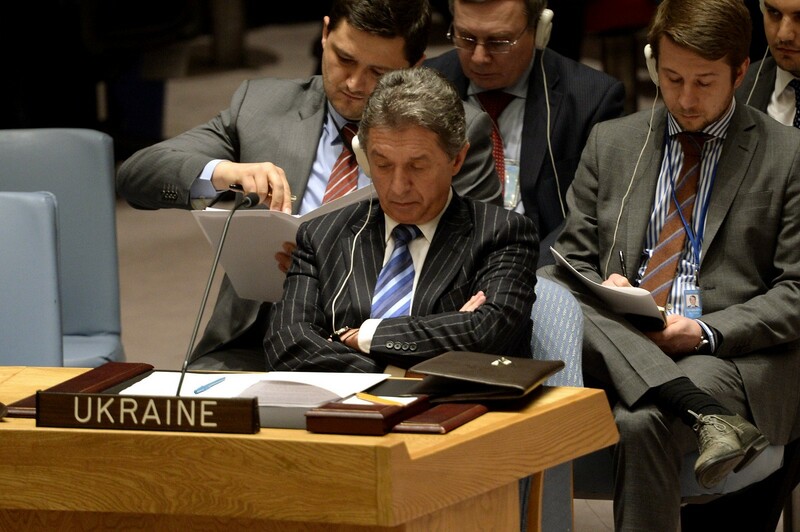 Ukraine Ambassador to the United Nations Yuriy Sergeyev is seen during a Security Council meeting at the United Nations in New York March 3, 2014. 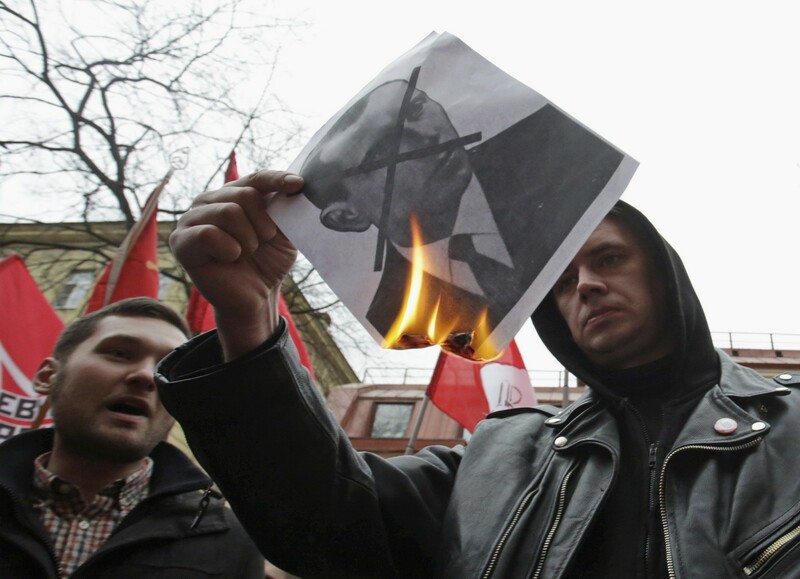 Activists burn a picture of late Ukrainian nationalist movement leader Stepan Bandera, during a rally to support the possible military incursions of the Russian army onto the territory of Crimea to defend Russian citizens and speakers living in Ukraine, near the consulate of Ukraine in St. Petersburg, March 3, 2014. 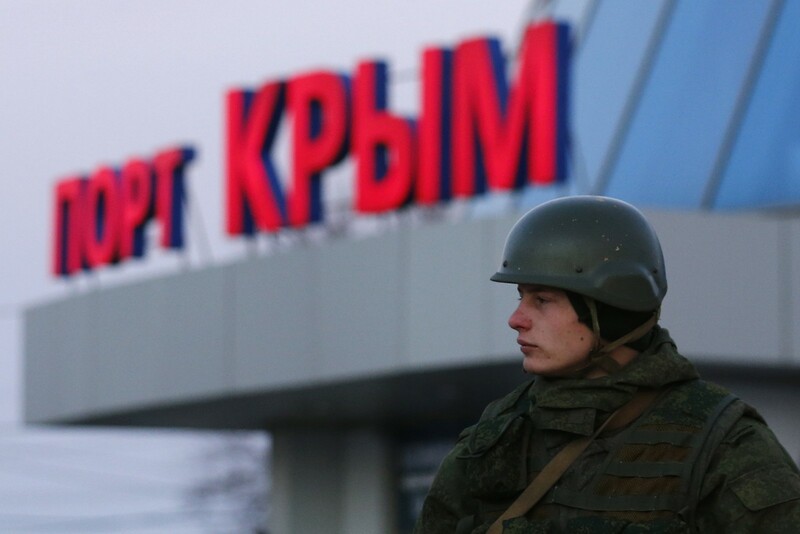 An armed man, believed to be a Russian soldier, stands outside the civilian port in the Crimean town of Kerch March 3, 2014. 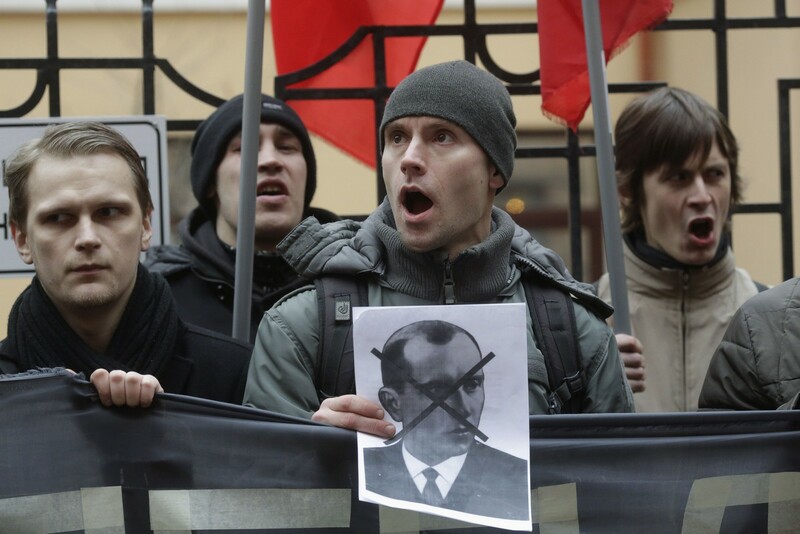 Activists hold a rally to support the possible military incursions of the Russian army onto the territory of Crimea to defend Russian citizens and speakers living in Ukraine, near the consulate of Ukraine in St. Petersburg, March 3, 2014. 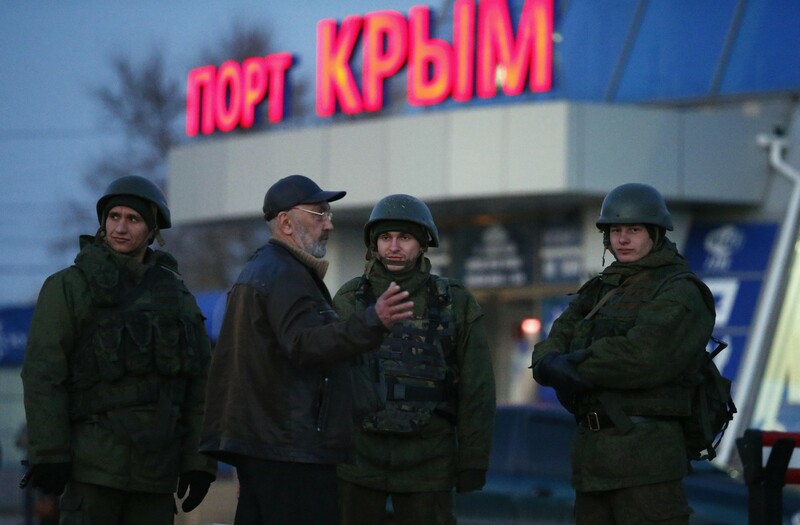 Armed men, believed to be Russian soldiers, stand outside the civilian port in the Crimean town of Kerch March 3, 2014. 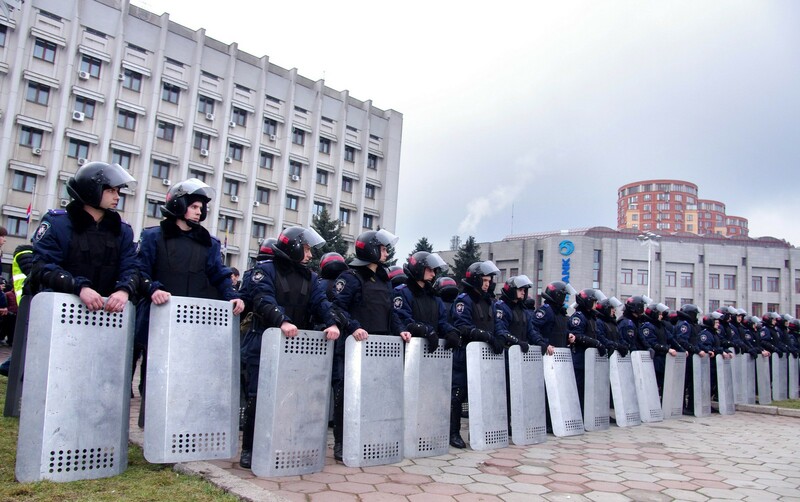 Ukrainian riot police stand guard around a regional state administration building in the Black Sea city of Odessa to prevent pro-Russian activists from storming the building, on March 3, 2014. 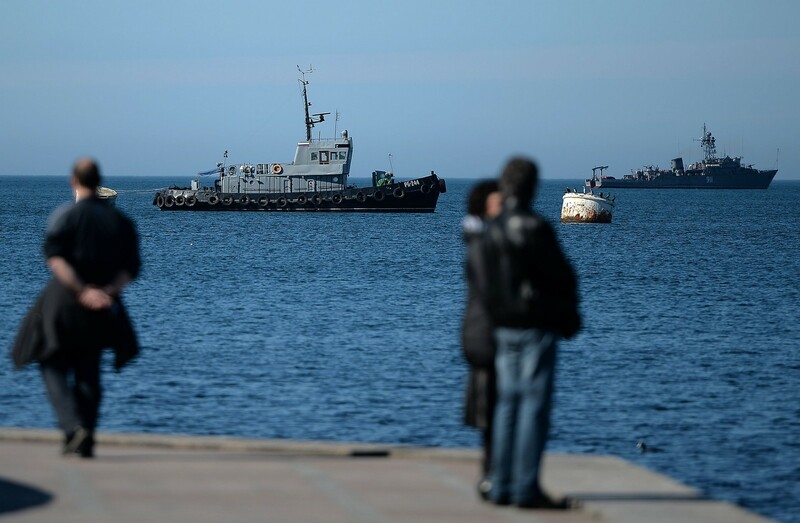 Russian Navy ships pass by Sevastopol harbour on March 3, 2014. 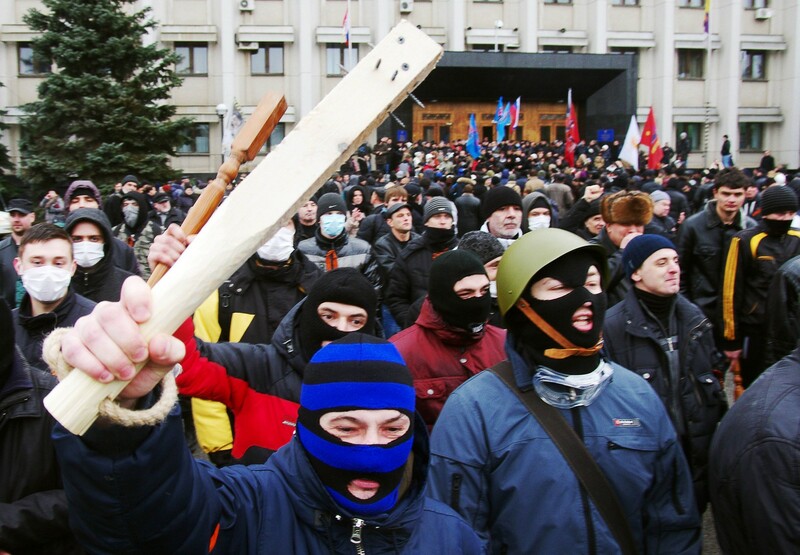 Pro-Russian activists wave clubs as they react after an unsuccessful attempt to storm a regional state administration building in the Black Sea city of Odessa on March 3, 2014. 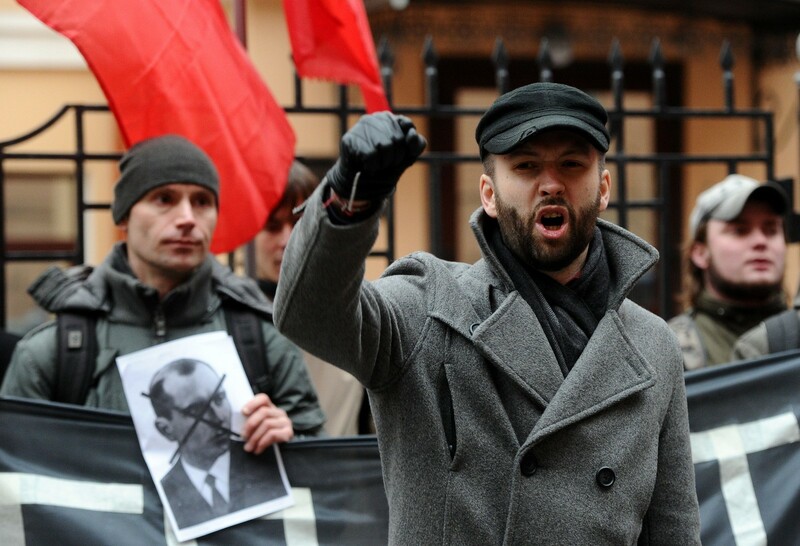 A Pro-Russian activist waves a chain after an unsuccessful attempt by the demonstrators to storm a regional state administration building in the Black Sea city of Odessa on March 3, 2014. 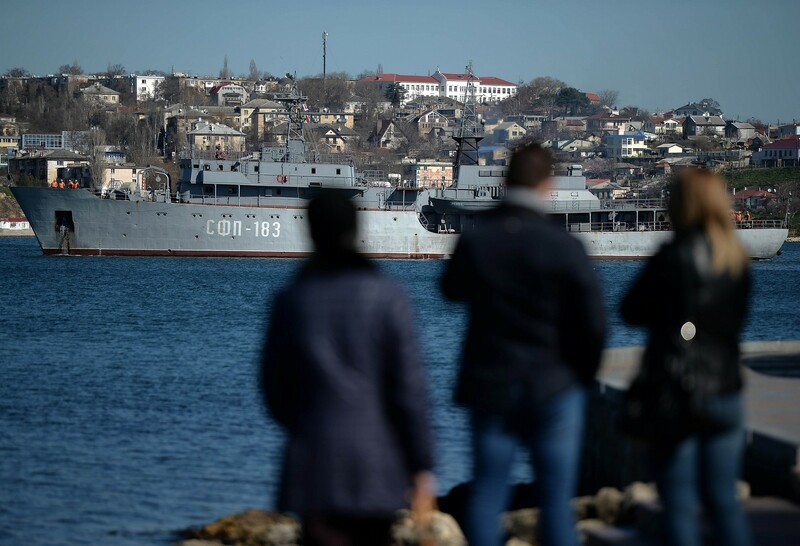 A Russian Navy De-Gaussing Ship passes in Sevastopol harbour on March 3, 2014. 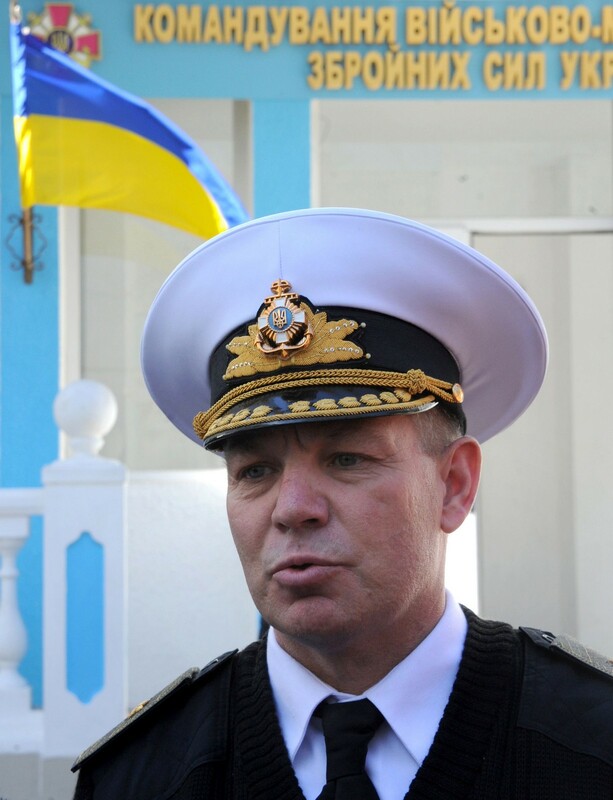 Newly appointed Ukrainian commander of the Black Sea Fleet Sergey Gayduk speaks in front of the Headquarters of the Ukrainian Navy near Sevastopol on March 3, 2014, as it was being blocked by unidentified armed men. 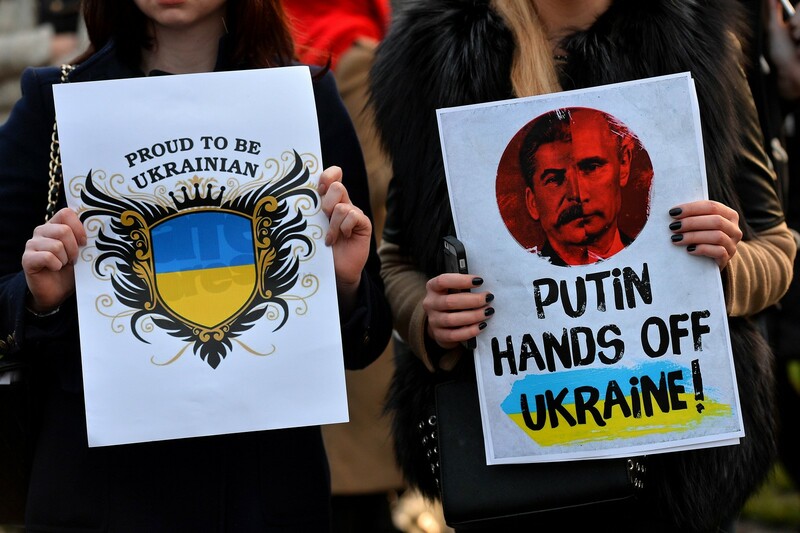 Protesters hold placards during a demonstration against Russia's involvement in the crisis in Ukraine, in London's Parliament Square, on March 3, 2014. 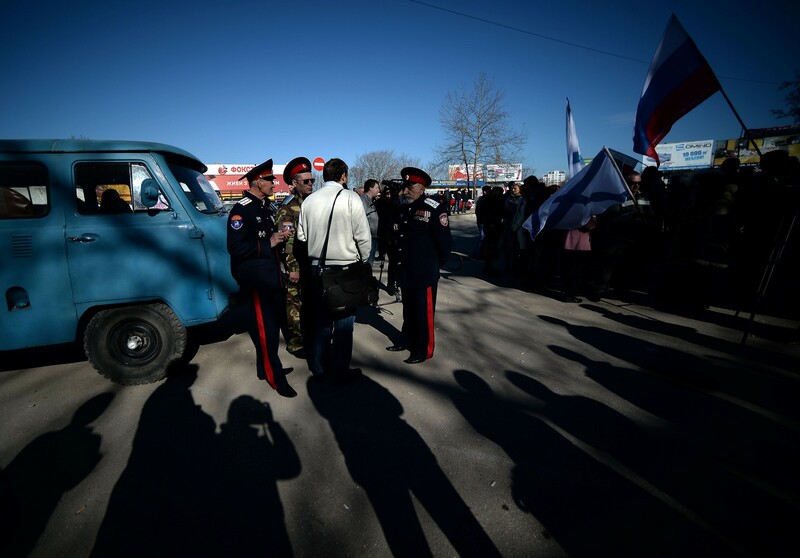 Pro-Russian demonstrators gather outside the headquarters of the Ukrainian Navy in Sevastopol on March 3, 2014. 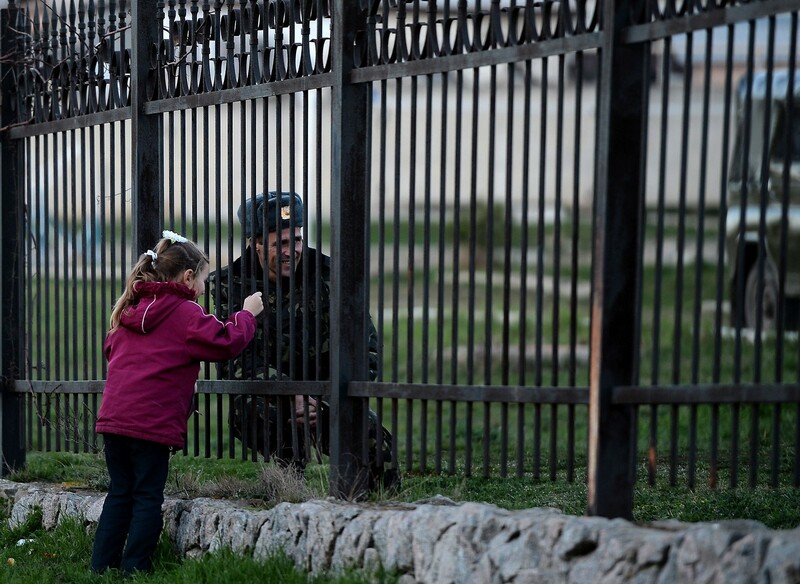 A Ukrainian soldier speaks to his daughter through a gate as he waits inside the Sevastopol tactical military brigade base near Belbek in Sevastopol on March 3, 2014. 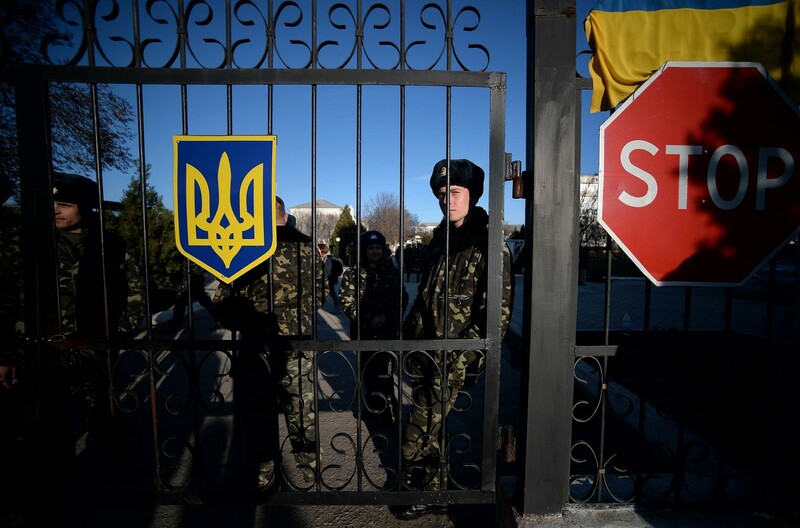 Ukrainian soldiers look out through a gate near a "stop" sign as they wait inside the Sevastopol tactical military brigade base near Belbek in Sevastopol on March 3, 2014. 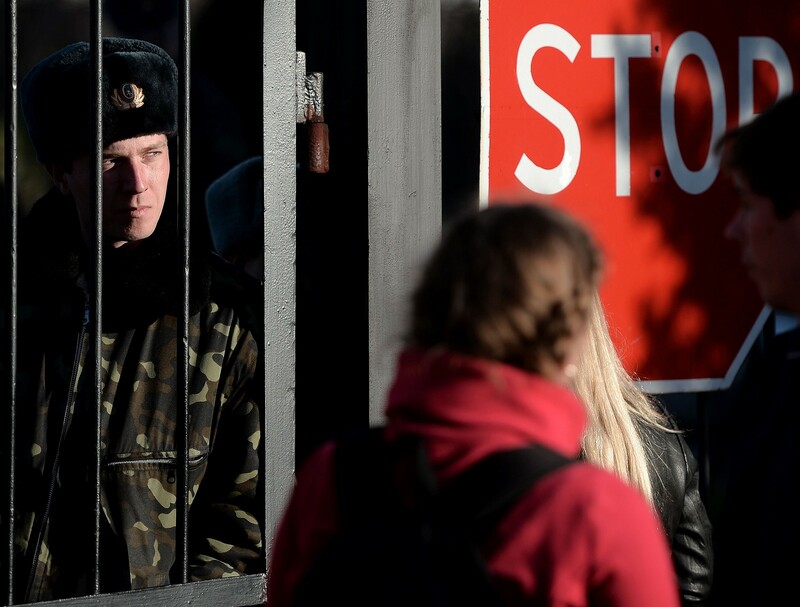 A Ukrainian soldier looks out through a gate near a "stop" sign, as Ukrainian soldiers wait inside the Sevastopol tactical military brigade base near Belbek in Sevastopol on March 3, 2014. 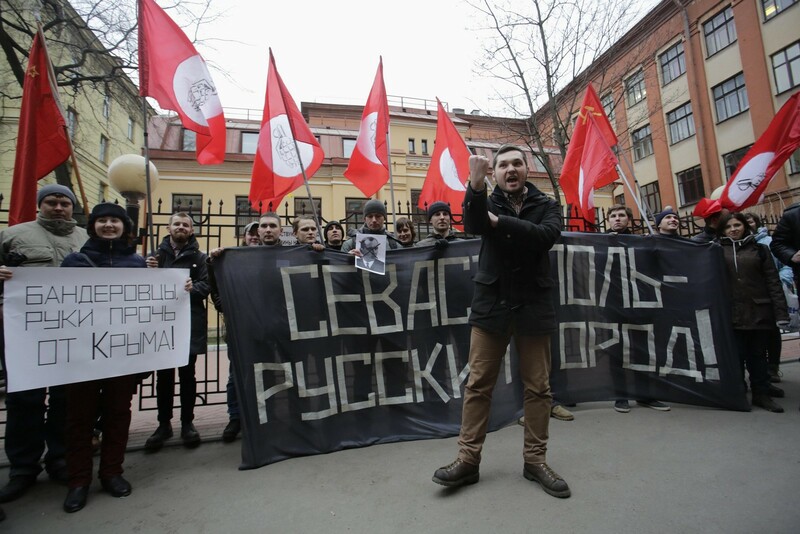 Activists of "Other Russia" opposition party rally in support of ethnic Russians in the Crimea and Eastern Ukraine in St. Petersburg, on March 3, 2014. 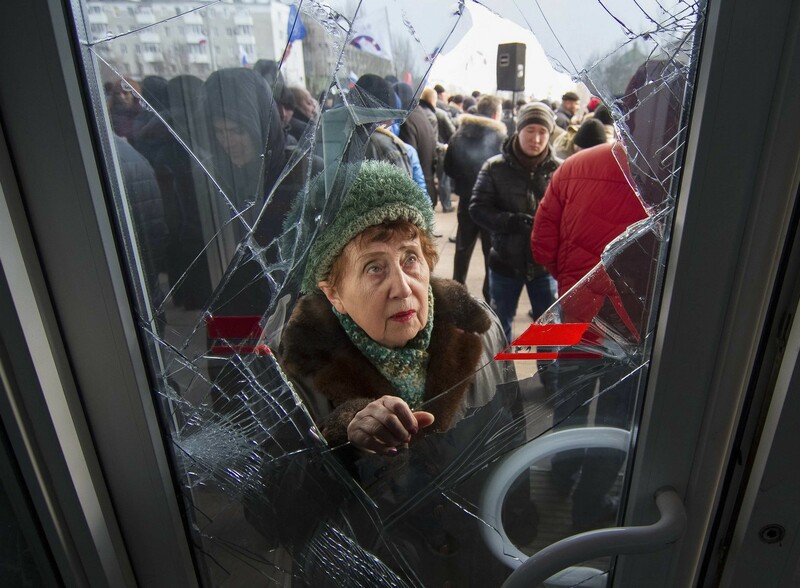 A woman looks through a damaged entrance door as pro-Russian demonstrators hold a rally outside the regional government building in Donetsk, March 3, 2014. 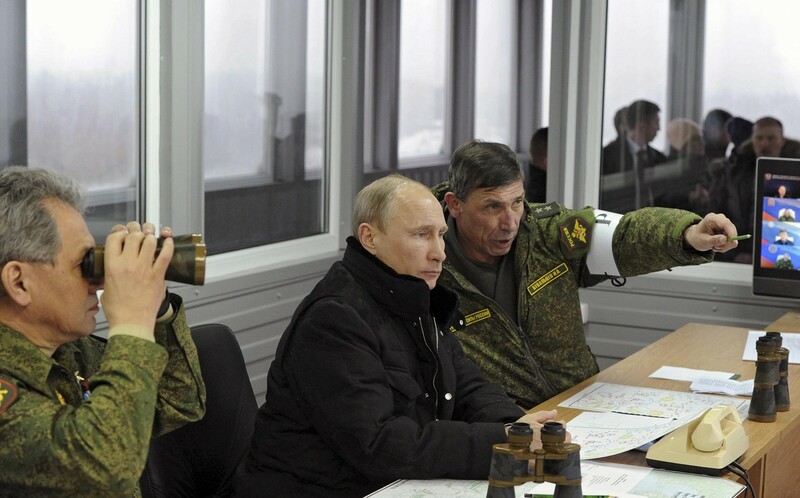 Russia's President Vladimir Putin (C), Defence Minister Sergei Shoigu (L) and head of the Russian army's main department of combat preparation Ivan Buvaltsev watch military exercises at the Kirillovsky firing ground in the Leningrad region, March 3, 2014. 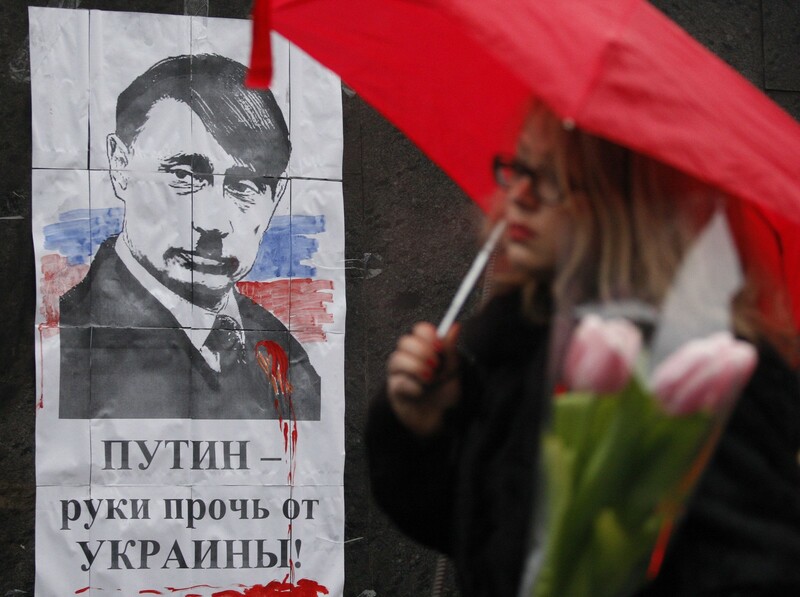 A woman walks in front of poster depicting Russian President Vladimir Putin as Adolf Hitler and signed "Hands off Ukraine" in Kiev on March 3, 2014. 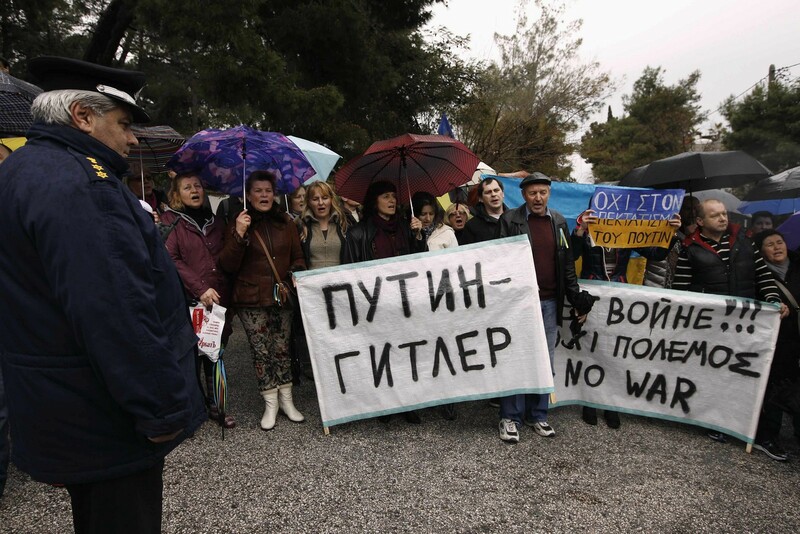 A Greek policeman looks at pro-Ukraine protesters holding a rally outside Russia's embassy in Athens March 3, 2014. 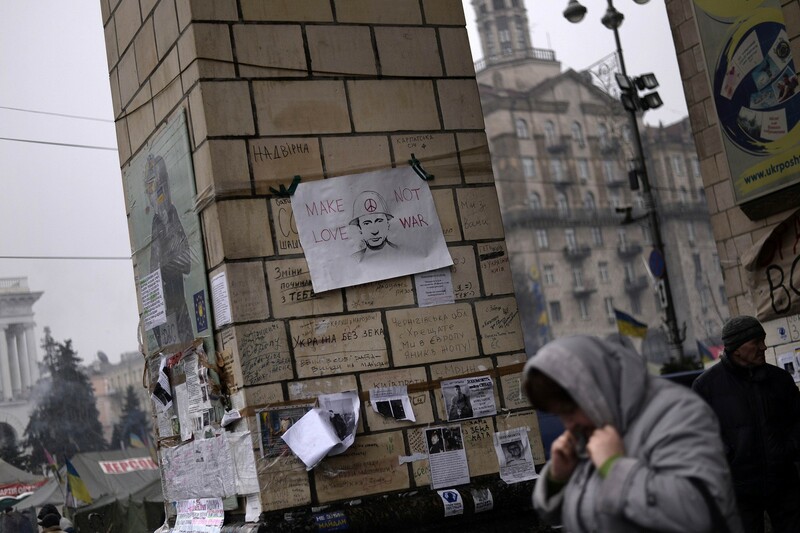 A woman passes by a poster depicting Russian President Vladimir Putin and reading "Make Love Not War at Independence square in central Kiev on March 3, 2014. 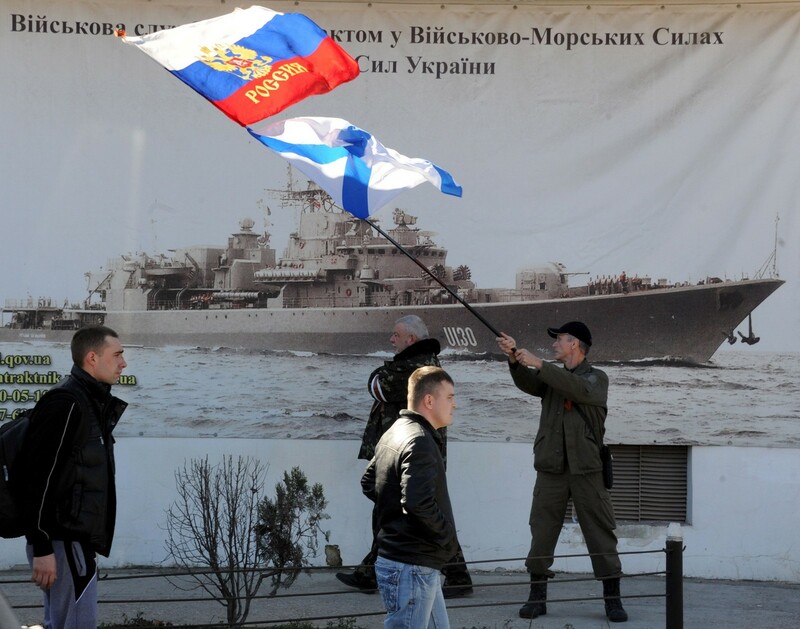 A man waves a Russian flag and a Russian Navy flag in front of the headquarters of the Ukrainian Navy in Sevastopol on March 3, 2014. 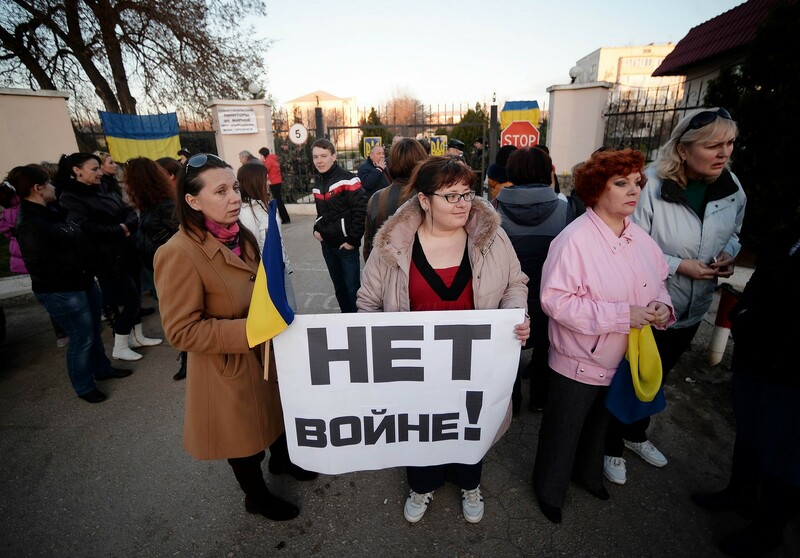 The wives of Ukranian soldiers hold a banner reading "No War" during a rally outside the Sevastopol tactical military brigade base near Balbek in Sevastopol, on March 3, 2014. 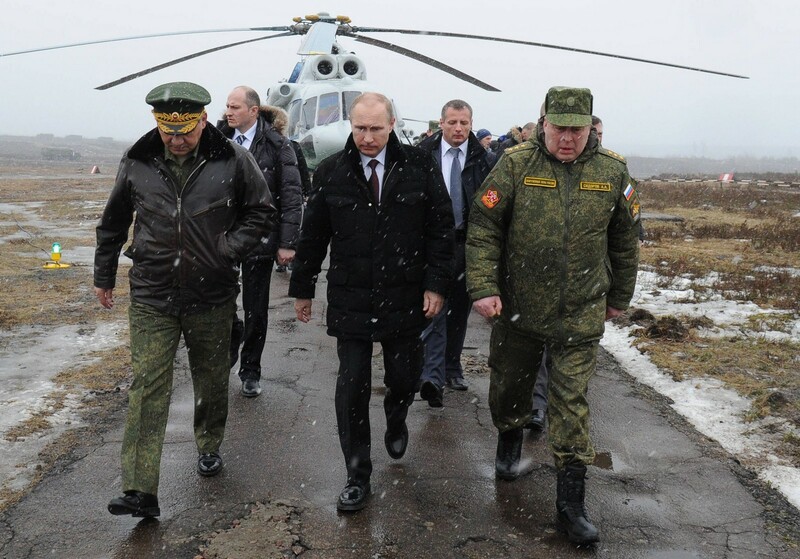 Russia's President Vladimir Putin (front C) and Defence Minister Sergei Shoigu (front L) walk to watch military exercises upon his arrival at the Kirillovsky firing ground in the Leningrad region, on March 3, 2014. 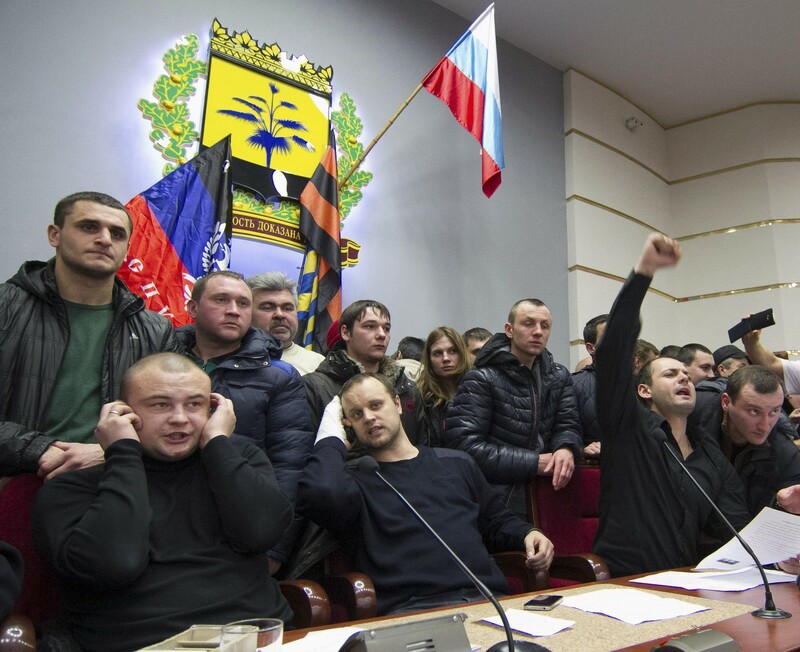 Protest leader Pavel Gubarev (2nd L, front) and other pro-Russian demonstrators hold a meeting after entering the regional government building in Donetsk, March 3, 2014. 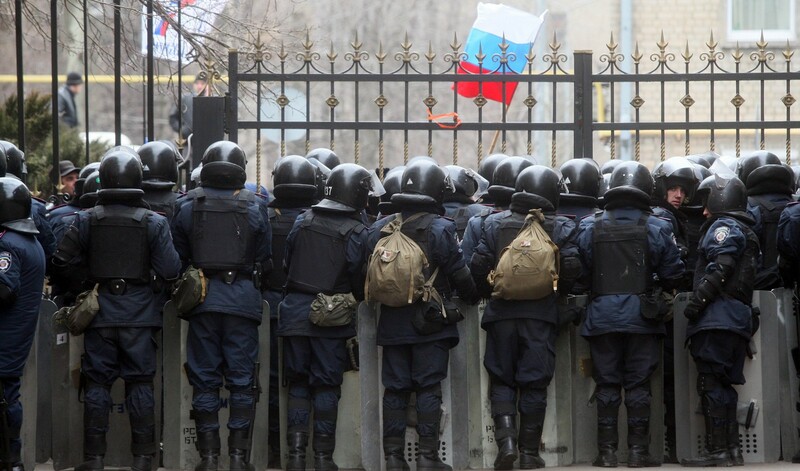 Riot policemen stand guard in front of the regional administration in Donetsk on March 3, 2014. 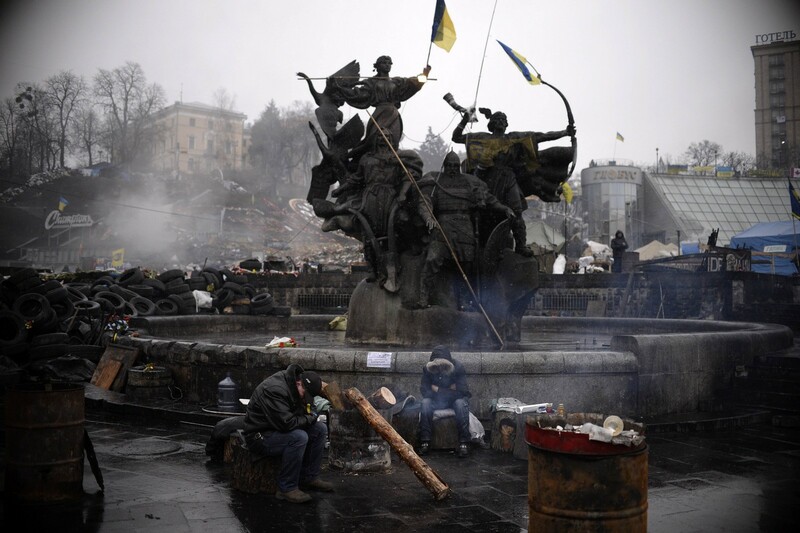 Men rest near a barricade on Independence square in central Kiev on March 3, 2014. 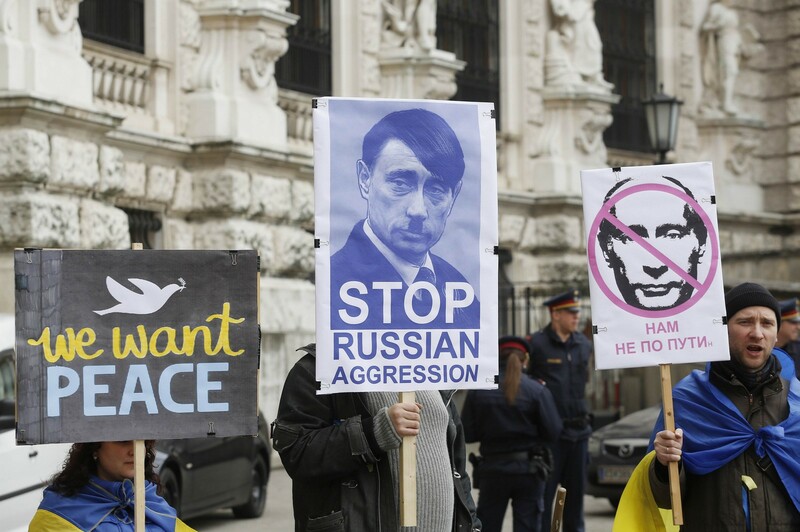 A small group of activists hold posters reading "we want peace" and featuring Russian President Vladimir Putin as German nazi dictator Adolf Hitler during a protest in front of the Hofburg castle, hosting the Organization for Security and Co-operation in Europe (OSCE) on March 3, 2014 in Vienna.